Seven burglaries, two robberies and one assault were reported to the police from Madison Valley during April. Because so much construction and remodeling is occurring in Madison Valley, and because construction sites are attractive targets for burglars, a significant proportion of Madison Valley burglaries are occurring there. 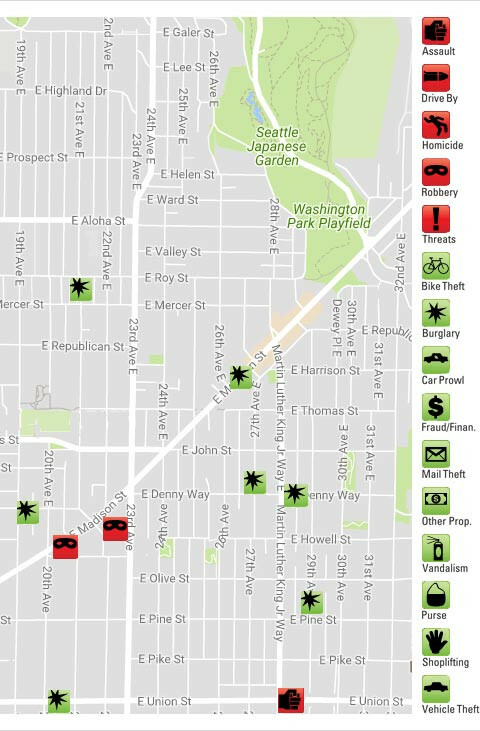 This month, four of the seven burglaries were at such sites. 1. At 6 AM on April 3 police were called to an apartment building being renovated on E. Union near 20th. When they arrived, a resident told them that he had heard what he thought were construction noises earlier that morning, but when the noises became very loud he realized that someone was trying to pry open the front door to his apartment. After setting off an alarm in the building, he called 911. Inspection of the building revealed that someone had broken into another apartment close by, but at the time of the police report it was not known if the burglar had taken anything from it. The burglar apparently left in a hurry because he left a flashlight behind. The police gave the flashlight to their Evidence Section to search for fingerprints. 2. Sometime during the night of April 8–9 someone pried open the front door of an almost-finished home under construction on 29th near Pine and took a boxed surveillance system worth $1500 that was being stored in the kitchen pantry. No fingerprints were found at the scene. 3. On April 11 at 8:30 AM police were called to a construction site on 27th near Denny to investigate a robbery that had taken place during the previous night. When they arrived, the victim told them that someone had broken into the site and taken a dehumidifier and a concrete saw. The police were unable to find fingerprints at the scene. 4. Sometime during the night of April 19–20 someone entered a home on 21st Ave. E. near Roy that is being remodeled. When the contractor arrived on the morning of the 20th he found that a plywood panel that covered a door had been pried off, and that items belonging to the home owner had been taken. The police found no fingerprints or other evidence about the burglary. 5. During the night of April 21–22 a burglar succeeded in opening the garage door of a town home on Madison near 26th and stole a bicycle and skiing equipment. The resident had left the door just slightly open to let it air out after a painting job on the evening of the 21st, but found the door completely open the next morning. No fingerprints were found at the scene. 6. There was a forced-entry burglary at a residence on E. Denny near MLK on April 30, but the police have not filed a detailed description of this incident. 7. Police were called to a home on E. Denny near 19th on April 30 to investigate a burglary that was taking place. When they arrived, residents told them that while upstairs they had heard noises coming from the ground floor of the home and that when they investigated they found a man searching though some jackets that were hung close to the front entrance. The man quickly fled the scene and although one of the residents chased after him, he outran her. After the police received a description of the burglar, another police unit found a man matching the description hiding in a doorway near 21st and John. While holding him for possible identification by witnesses, the police found a small bag of methamphetamine in his possession. After the residents of the home identified the man as the one who they had seen in their house, the police took him to the King County Jail. One of the two robberies reported in April involved theft at the Safeway store, and the other was reported by a victim whose report left police wondering about the veracity of his story. At around 6:30 AM on April 14 an employee working in an office behind the customer service counter at the Safeway store on E. Madison heard noises coming from just outside the office. When she investigated, she found that a woman was reaching behind the service desk and removing tickets from a lottery ticket dispenser. The employee then confronted the woman and started picking up some of the tickets that had fallen on the desk and the floor behind the counter. The woman then entered the area behind the service counter and physically assaulted the employee. When another employee came to the rescue, the woman threatened them both and they backed away. The woman then fled from the store and was last seen walking south on 23rd. The store provided the police with security camera footage of the incident. On April 11 police were called to investigate a robbery that had occurred on April 10. When they arrived, the complainant told them that at around 7:30 PM on the previous day while he was walking home a man had approached him and told him that he wanted the hat he was wearing. When the victim tried to flee, the robber tripped him and tried unsuccessfully to taser him. The robber then took the hat, described as a straw hat worth $175, and fled. The police report of this incident expresses skepticism about the complainant’s report, noting that he could not provide information about important features of the incident, that his account contained several inconsistencies in its details and that it also contained assertions about the event that are demonstrably untrue. Finally, there was an aggravated assault on E. Union during April. Shortly after 2 PM on April 10 police responded to reports of gunfire in the vicinity of E. Union and MLK. When they arrived, witnesses told the police that the shots had come from a dark colored vehicle that had fled south on 27th just after the incident. While gathering evidence at the scene, the police learned that a 911 call had just come in from two people reporting that they had been shot at while driving in the area. The victims told the police that they had been driving on Rainier Ave. in Columbia City when a vehicle attempted to cut them off. As they continued along Rainier, the vehicle started following them and they became frightened, until the vehicle disappeared. Later, however, the vehicle appeared again when they were driving north on MLK and resumed following the victims. Finally, in the vicinity of MLK and Union occupants of the following vehicle opened fire on the victims. Shortly after the police interviewed the victims, the car from which the shots were fired was discovered by the police and several people were taken into custody.